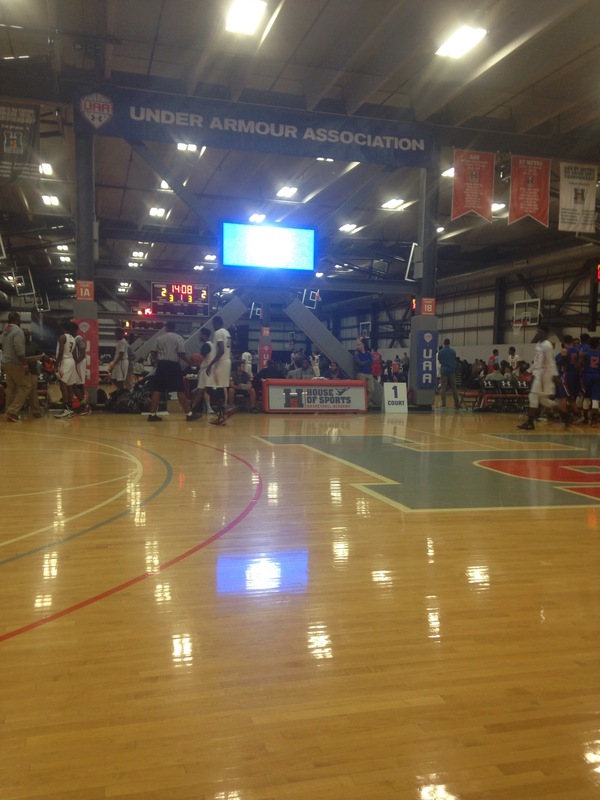 Over the weekend at House of Sports, there was a lot of great talent in attendance. Many of the teams and players were nothing short of spectacular. For many of the teams, this was their last chance to qualify for a spot for the UAA Finals in July, where only the top 16 teams in the Hungry & Humble Divisions for both the 16U & 17U would compete for the Under Armour title. Markelle Fultz, DeMatha Catholic HS (MD)/DC Blue Devils, Class of 2016 – Fultz can get to the basket, has good ball-handling skills, is a good passer, knows when to shoot, has a good feel for the game. He holds offers from Ohio State, Louisville, Pittsburgh, Seton Hall, Oklahoma, UConn, Washington, Wake Forest, Virginia Tech, Oklahoma State, Arizona, NC State, High Point, USC, Rhode Island, DePaul, Xavier, West Virginia, Kansas, Penn State, Virginia, Kansas, Florida State, Towson, Miami, George Mason, Cincinnati, Georgetown, Cal State-Northridge, South Carolina and Memphis. Quade Green, Neumann-Goretti HS (PA)/WE R 1, Class of 2017 – Green is a flat-out scorer that is fearless. He can shoot plenty of jumpers and is always liable to take it to the cup. He holds offers from Virginia Tech, Penn State, Michigan State, South Carolina, Missouri, Maryland, St. Joseph’s, Rhode Island, Temple and Providence. Terrance Ferguson, Prime Prep Academy (TX)/Mo Williams Academy Elite, Class of 2016 – Ferguson is tall and lanky, and is a human highlight reel. He has good athleticism and can score at will. He also has a smooth stroke. He holds offers from Houston, Kansas, Texas A&M, Arkansas, Texas Tech, Baylor, Oklahoma, Texas, Arizona, Oklahoma State, Tulsa, SMU and Louisville. Trevon Duval, St. Benedict’s Prep (NJ)/WE R 1, Class of 2017 – Duval was nothing short of spectacular this weekend. He knows how to set up teammates for baskets. He is very athletic and can do damage by going above the rim and finishing as well as shooting efficiently from many spots on the floor. He holds offers from Virginia Tech, Louisville, Penn State, Maryland, South Carolina, Syracuse, California, Seton Hall, Rutgers, Villanova. Miami, SMU, Pittsburgh, Cincinnati and UConn. Jalek Felton, Mullins HS (SC)/Team Felton, Class of 2017 – Felton is a good passer, but also is a great athlete overall. He can fly above the rim, and is capable of scoring in many ways. He is committed to North Carolina. Kwe Parker, Wesleyan Christian Academy (NC)/Team Felton, Class of 2016 – Parker is a guard with athletic ability that can also shoot. But he is mainly a human highlight reel. He holds offers from Wake Forest, Boston College, Clemson, Western Carolina, Florida State, Rutgers, Kansas State, Nebraska, Charlotte, Virginia Tech and Old Dominion. Hamidou Diallo, Putnam Science Academy (CT)/NY Jayhawks, Class of 2017 – Diallo is a good shooter and has great moves to the basket. He can also take contact when going to the cup and can also fly high. He holds offers from Wake Forest, Seton Hall, VCU, Iowa State, UMass, Providence, Minnesota, St. Bonaventure, UConn, Fairfield. Cal State-Bakersfield, Iona, St. John’s, USC, St. Peter’s, Duquesne and Temple. Billy Preston, Prime Prep Academy (TX)/Mo Williams Academy Elite, Class of 2017 – Preston is a great low-post presence that can also handle the ball like the guard, but is also a bully in the paint. He holds offers from UNLV, Kansas, Baylor, New Mexico State, UCLA, UConn, Utah, Arizona State, Fresno State and Oregon. Brandon Childress, Wesleyan Christian Academy (NC)/DC Blue Devils, Class of 2016 – Childress is an efficient shooter who can knock it down from anywhere on the floor and also can score when needed to. He is committed to Wake Forest. Seventh Woods, Hammond School (SC)/Carolina Wolves, Class of 2016 – Woods is an athletic guard that is known for his highlight-reel plays. He holds offers from Clemson, North Carolina, South Carolina and Wichita State. Stevie Jordan, Conwell-Egan Catholic HS (PA)/Philly Pride, Class of 2016 – Jordan is a pure point guard that knows how to make his teammates better. He can set his teammates up for baskets easily and also has a nice handle. He holds offers from Rider, Richmond, Towson and Hampton. Luther Muhammad, Hudson Catholic HS (NJ)/SportsU, Class of 2018 – Muhammad is a great shooter and is efficient at attacking the basket. He holds an offer from Rider. Charles Payton, Bloomington HS (IL)/Illinois Wolves, Class of 2017 – Payton is an athletic leaper that knows how to get to the basket. He is efficient at blocking shots. He holds an offer from UIC. Sunday Okeke, Greens Farms Academy (CT)/New Heights, Class of 2017 – Okeke is a mobile big man that can dribble and has good post moves. Donald Flores, Lincoln HS (NY)/New Heights, Class of 2017 – Flores is an efficient shooter who is able to get to the basket with ease despite his small size. David Beatty, Archbishop Caroll (PA)/Philly Pride, Class of 2017 – Beatty is a good shooter and is also very athletic, he can also pass and rebound. He holds offers from Siena, Penn State and St. Joseph’s. Atiba Taylor, Hackensack (NJ)/SportsU, Class of 2018 – Taylor is a good shooter and has a great skill set. He holds an offer from Manhattan. Bol Bol, Bishop Miege (KS)/ KC RUN GMC, Class of 2018 – Bol is a big that is prone to shot-blocking. He can also rebound with authority. He has a good motor and can also shoot as well as pass. Nazreon Reid, Roselle Catholic (NJ)/SportsU, Class of 2018 – Reid is a dominant big that can block shots and terrorize the paint offensively. He holds offers from LSU, Kansas, UConn, Maryland, North Carolina State, Seton Hall, St. John’s, Villanova, Oklahoma, Virginia & Iowa. Caheim Brown, St. Raymond HS (NY)/Juice All-Stars, Class of 2016 – Brown is an athletic guard that dunks with two hands at will. He is also an aggressive scorer. He holds offers from Manhattan, Hofstra, Iona and Seton Hall. Josh Jackson, Prolific Prep Academy (CA)/1 Nation, Class of 2016 – Jackson is an offensive dynamo that is athletic on both ends of the court. He also finds plenty of ways to score. He holds offers from UNLV, Maryland, Kansas, Auburn, Michigan State and Arizona.